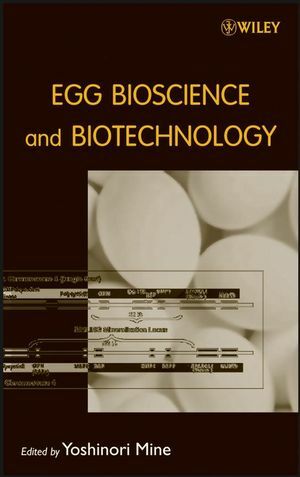 Egg Bioscience and Biotechnology provides a very focused look at the most recent advances in the study and value-added use of the bioactive components of eggs. This book focuses mainly on biologically active substances derived from egg components and their potential use. These include substances with anti-microbial, anti-adhesive, immunomodulatory, anti-cancer, anti-hypertensive, and anti-oxidant properties. YOSHINORI MINE, Ph.D., is a Professor and Chair of Egg Material Science in the Department of Food Science at the University of Guelph, Ontario, Canada. Dr. Mine has edited several books and authored numerous book chapters, and more than 100 peer-reviewed articles in international journals. 1 Structure and Chemical Compositions of Eggs (Eunice C. Y. Li-Chan and Hyun-Ock Kim). 3 Bioavailability and Physiological Function of Eggshells and Eggshell Membranes (Y. Masuda and H. Hiramatsu). 5 Bioactive Components in Egg Yolk (Hajime Hatta, Mahendra P. Kapoor, and Lekh Raj Juneja). 6 Egg Allergens (Marie Yang and Yoshinori Mine). 7 Production of Novel Proteins in Chicken Eggs (Robert J. Etches). 8 Egg Products Industry and Future Perspectives (Glenn W. Froning).